Planning a medieval event at Bolton Castle and need to book medieval entertainment? We’ve played there many times and really enjoyed the incredible atmosphere that live medieval music brings to the venue – let me explain – the castle rooms lit by torchlight and the stone flags create a real air of magic that is hard to beat when combined with the sounds of medieval minstrel instruments the hurdy gurdy hammer dulcimer, bagpipes and drums it really takes you back to another time. The Grinnigogs are medieval minstrels experienced in providing music and entertainment at medieval banquets, weddings, handfastings, parties, themed evenings and corporate events. 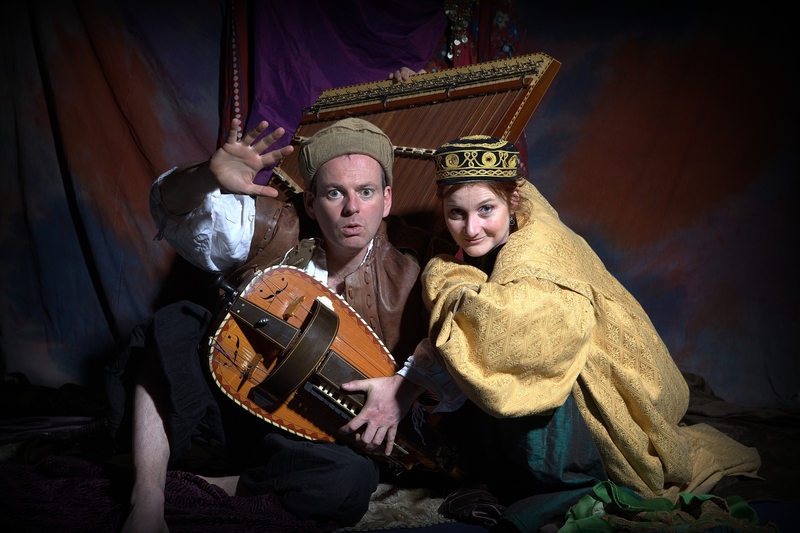 The Grinnigogs specialise in the performance of Medieval and Tudor and music.The Grinnigogs Minstrels have surprised, delighted and entertained audiences all over the world. Playing exciting, uplifting and sensual music on a diverse range of instruments using a variety of medieval instruments like Hammer Dulcimer, Hurdy-Gurdy, Bagpipes, Shawms, Percussion, Violin and Cittern – they can perform as soloists, as a duo or as a band with up to seven virtuoso musicians. The Grinnigogs also offer medieval story-tellers, jesters, jugglers, magicians, stilt-walkers and fortune tellers to add theatricality and spectacle to any event. The Grinnigogs work from a fixed spot or as strolling players and can perform acoustically or with amplification. Here is what one of our customers said about our performance at Bolton Castle. WOW…On behalf of The Savile Household, and our guests The Beaufort Companye and Knights in Battle, may I just just say what an absolutely brilliant time we all had at Bolton Castle last night. Bolton itself is an excellent setting for a medieval banquet – what with the authentic rooms, candlelight, roaring fire (and roaring draughts! ), plenty of drink and many many friends – it was all turned into a magical experience by the music and dancing of The Grinnigogs – you really turned the evening into something to remember. I cannot tell you how many compliments I have received about you and your music, and the atmosphere you created….. and why we have not come across you before!